To big fans of Minecraft, Mine Blocks 1.22.6 is one of the games that make us feel free to build a private world. Sharing with other Minecraft games, Mine Blocks 1.22.6 allows us to satisfy our exploratory needs through discovering, searching, creating things from natural materials, and protecting ourselves. In a primitive world, we are forced to work hard so that we can survive. We need to make use of simple and available things around us from grass, coal, rock, dirt, and wood, etc. Normally, we rely on the efficiency of powerful and automatic machine to finish our work. We also have family members and good friends to help us when we meet difficulty, but in Mine Blocks 1.22.6 we have to stand firmly on our feet since none excepts us lives in the world of this game. Hence, simple materials must be collected to craft useful things to maintain our survival. Accepting to play the game does not only require us to experience the pleasure of exploring but also force us to take risks since we must look out for enemies. We may not have enough time to enjoy being freely in our world-to-be because of lack of safety. Enemies are wandering around or hiding somewhere to catch us. Once they touch us, they do harm to our lives by taking blood out of our body, and our lives are shown on a bar at the bottom of the screen. We may try to focus on gathering materials to craft as many tools as possible, especially weapons before confronting dangerous creatures. So as to help players succeed in crafting necessary stuffs, the game describes clearly how to make things in Instructions option. The FAQ option also assists players with answers to common questions about details of the game. 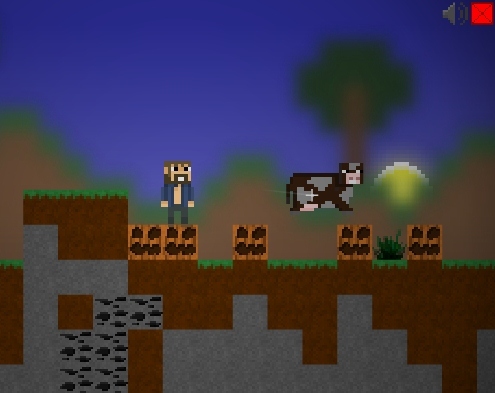 In sum, Mine Blocks 1.22.6 is waiting for players to experience new features such as the existence of dogs and wolves, skeletons, cocoa beans searched in chest, repaired lakes, seaweed, and inventory, and other interesting ones shown in the beginning. Thanks to humans’ spirit of adventure, it seems not so much difficult to complete duties and get over enemies in Mine Blocks 1.22.6. Share Minecraft community how far we have reached in the land called Minecraft and express our feelings and ideas as well to build up a better Minecraft game. Either Arrow Keys or WASD can be used to control the Minecraft character. Left-clicking and Shift are used for putting blocks. Left-clicking is for mining or crafting.